Samus has been brainwashed by Ridley. Her past adventure on Zebes was all in her head or was it.. Behold the ultimate challenge! 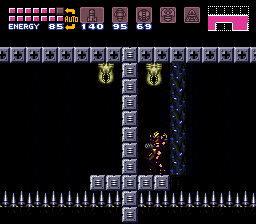 This is Super Metroid Impossible Redesigned! Requirements: Save states. 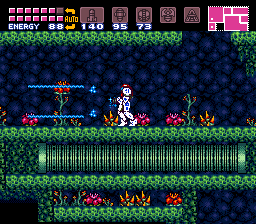 This game is designed for Super Metroid experts who know how to perform all the SM moves. This is your typical halfhack. It has bad colors, a red Crateria like every other one before it, spikes jabbing you around every corner, fake items, forced gauntlet, permastucks, etc. It is NOT a hack you play if you want to blow off some steam. There are gates in many different places making progression almost completely linear with the exception of a couple items. If you stop paying attention for a little bit, you might fall into one of the tens of death traps that were set, many of them being in Norfair and Maridia. 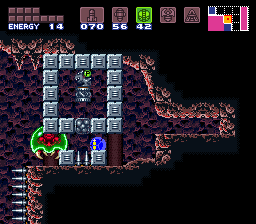 The thing that probably bothered me the most was forcing the player to go through as much of a room as possible to get to the other side. What I mean by this is morph ball mazes, blocks placed just as obstructions so you can’t get to where you want to go the short way, invisible blocks, and other things. In short, play this hack if you want to be confused and annoyed. And yes, it is fully beatable. The worst thing about this hack is that it's painfully boring. The best thing about this hack is that you can get a sense of how boring and poorly designed it is from the first few rooms. 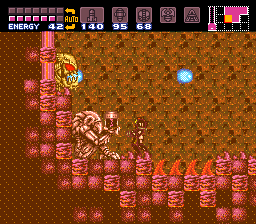 I've always been a fan of challenge hacks, such as Cliffhanger and Super Mega-Metroid X-2. If you like those hacks, this is not for you. It offers nothing more than rooms of spikes and attempts to troll the player. Not only is the hack not interesting, it's also pretty broken. 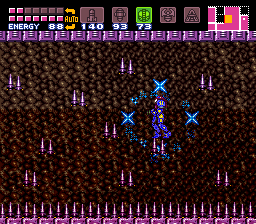 Tons of palettes are wrong, and the enemy graphics are all messed up in some rooms. Everyone should be able to remove the artist from the art (or in this case poorly designed half hack), but it's important to note that the author doesn't take criticism, and as a result you can be fairly confident that this hack is not going to improve over time. The tile errors, perma-stucks, palette problems, are all likely to be permanent fixtures of this hack. So tl;dr: don't bother with this hack. Obviously. Oh and the writing for the intro sounds like a bad fanfiction, so there's that.